Joel’s lifelong passion for glassblowing began in his college days at the Rochester Institute of Technology. It was the early 1970’s and the school had just opened its School of American Craftsmen’s glassblowing program. Following these initial introductions, Joel went on to teach himself the craft and by the late 1970’s had built his own hot shop. It was at this time that he and his wife, Candace Luke-Bless established what would become Glasslight. Since then, Joel has refined and honed his work constantly innovating techniques and designing new pieces. His products have ranged from small table lamps to Judaica to his newest endeavor, large-scale chandeliers. Over the years, Joel has also discovered his love of teaching and now engages the community by offering glassblowing classes. Always excited to meet new people and answer questions about his work, Joel is a true artisan and spokesman for the craft. 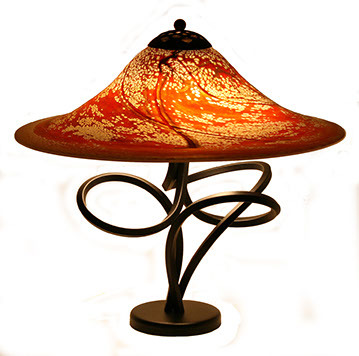 Each lamp is a unique combination of a colorful hand-blown glass shade with a sculptural hand-bent metal base. Two sockets with pull chains use standard bulbs. An in-line dimmer switch (on the cord) provides additional lighting control. Metal bases are powder coated black. All parts comply with all applicable UL standards. Each lamp is signed and dated.